A quick look at any general aviation airport will show you that all single engine aircraft are either high wing or low wing designs. For pilots, each design has its advantages and drawbacks. 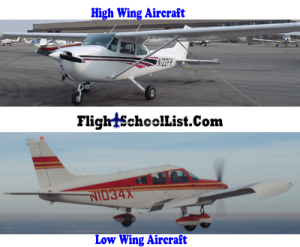 High wing aircraft have been popular since the beginning of general aviation. This design is prominent in early Piper aircraft, most Cessnas, and many newer, light sport aircraft. It provides pilots and passengers with an unobstructed view of the ground, as well as protection from the elements when standing beneath the wing. They are also the preferred design for aircraft operating from unimproved airfields as the wing is less susceptible to damage from obstructions on the ground. Another advantage is that fuel can be fed to the engine by gravity, so a fuel pump may not be necessary. The most significant drawback to the high wing design is its inherently restricted visibility when maneuvering. The high wing makes it difficult to see higher altitude traffic on either side of the aircraft. When turning, traffic in the direction of the turn is obscured. This problem is partially mitigated by some designs which place the cockpit ahead of the wing. Having a window above the pilot can help too. Nevertheless, when flying a high wing aircraft it will still be necessary to raise the wing to clear traffic before executing a turn, especially in the pattern. Other minor drawbacks include difficulty fueling the aircraft and the potential for head injuries when pedestrians inadvertently collide with the wing. Low Wing aircraft are perhaps even more popular, and there are more of them currently being offered by manufacturers. Low wing aircraft are more difficult to enter, as they typically require that they pilot climb up onto the wing. This can be difficult during inclement weather. Low wing aircraft have the advantage of being easier to refuel, however they will require the use of a fuel pump to ensure proper fuel flow to the engine. From a visibility standpoint, pilots of low wing aircraft have a better view of traffic in all directions but below. It is for this reason that collisions between a descending low wing aircraft and an ascending high wing aircraft are the most common type of mid-air accidents in the pattern. After decades of production, the continued presence of both high wing and low wing aircraft on the marketplace is proof that neither design is superior for all purposes. Certainly those who enjoy sightseeing, aerial photography, or operation from backcountry airfields will prefer the ground visibility and terrain clearance of the high wing design. At the same time, others remain loyal to the low wing design for its in-flight visibility and easy of fueling. In many other cases, people will choose to purchase or rent a particular aircraft for features unrelated to its wing location. Regardless of which type of aircraft you fly, it is important to be aware of its designs limitations in order to ensure proper visibility and flight safety. Jason D. Steele is a writer, pilot, and flight instructor in Denver, Colorado. He is an FAA Certified Flight Instructor and Instrument Instructor and holds a commercial rating in Single Engine, Multi-Engine and Glider aircraft.